The complete radial and hoop stress distributions are indicated in Fig. 4.4. Fig. 4.4. 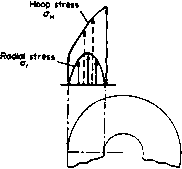 Hoop and radial stress distribution in a rotating hollow disc.